In Black Town and looking buy a trampoline? Your perfect trampoline isn't far away! Vuly aims to provide the best service to our customers in Black Town; it's why we have a Distribution Centre near you ready for delivery! Get your new trampoline Black Town wide with a supportive safety net and no contact zones. 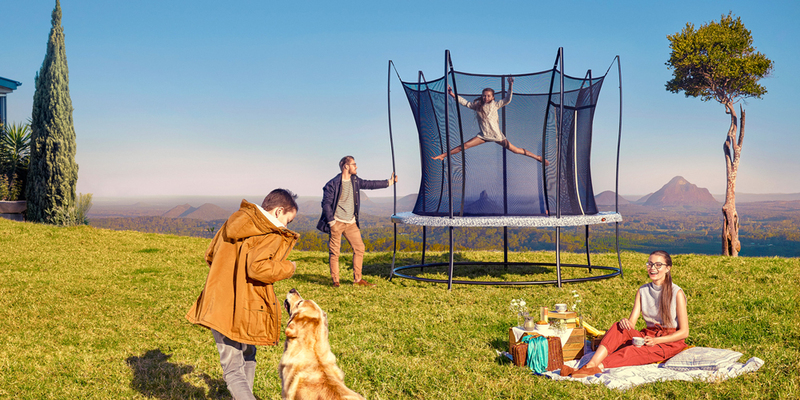 Safe and fun – a Vuly trampoline will have a home in your backyard for years to come. Vuly offer the best play products in Australia, that are some of the safest in the world.Our models are built for safety and are designed to last, engineered to resist the harsh Black Town climate. They are certified by a 500 hour test for resistance to UV rays, completed in a longer-term UV accelerator. Read and follow all instructions in your Assembly Manual before using any Vuly trampoline. Did you know that a trampoline is more than just a diversion? When your little ones are jumping, there’s a lot more happening behind the scenes than you would think. Last week, we discussed how great trampolines are for adults trying to get themselves into shape, but for kids, a trampoline is a world of wonder, magic and—without them even knowing—fitness and body training. When it seems like everything that kids enjoy is bad for them, like TV and mobile video games, the humble trampoline is an invigorating and safe (if you choose the right one) activity that parents can feel comfortable with. Today, we’ll go through 4 of the best reasons why a trampoline is more than just plain fun for your kids. By dramatically increasing muscle activity, bouncing on a trampoline, according to NASA, is “the most efficient, effective form of exercise yet devised by man.” However, trampolining also helps your body produce and circulate more oxygen: your brain’s fuel. Combine this with some fun games that improve cognition, like those with our HexVex® Game Mat system, and you may find that trampolining helps your child mentally, as much as it does physically. Bouncing constantly shifts your child’s centre of gravity. Their bodies have to respond quickly and subtly by adjusting their position along different axes, which improves their coordination and balance. That’s important even if they don’t grow up to be athletes! Trampolining also helps fortify young bones, joints and muscles. Our families are living increasingly sedentary lives, but consistent trampolining can help reduce the risk of developing brittle bone disease, fractures and future osteoporosis. It gives your child the musculoskeletal strengthening activity that they might otherwise be missing. Behavioural issues can be hard for parents to work though; however, much ‘bad behaviour’ is simply caused by excess energy being spent at the wrong place and time. Trampolining acts as a positive outlet, and by expending that energy in a way that also increases oxygen intake, they’ll boost their concentration and alertness for the times when they need to focus—like for homework. For children with special psychological needs, the repetitive movement associated with bouncing on a trampoline can also help alleviate stress, and make them feel more calm. Being a kid is tough, but so is being a parent. Sometimes you just need to take time for yourself. A supremely safe trampoline, like the Vuly2, can give you confidence that your child is engaging in a stimulating activity during the time that they spend occupying themselves. Read a book while you’re sitting outside and watching your child bounce; it’s a lot more relaxing than supervising playtime inside! Have you noticed a difference in your child since they started trampolining? Are they calmer, or more attentive, after bouncing? Do they have better coordination? Maybe they just don’t want to stop bouncing! After all, there aren't many children in the world that can resist jumping onto something springy, so see our trampoline range today.